Access to Chicago and Cook County records has changed a number of times in the 10+ years I've been doing research in the city and sometimes it's hard to keep up. This is the first in a series of three posts aimed at answering the question, "Where should I look for vital records?" For marriages, in short, (no matter what an index search may tell you about availability), you can get licenses from 1871 to 1941 online through FamilySearch by visiting a Family History Center or an affiliate library. After that, you'll need to contact the Cook County Clerk's Office for the records. Unlike birth and death records, marriage licenses were numbered consecutively without starting over. So, if you have a license number, you can easily pick a "film" from the record groups linked below and play the high/low number game to zero in on the right image. If you have a film number and an image number, you can go right to the document. And, if you have neither, all is not lost. 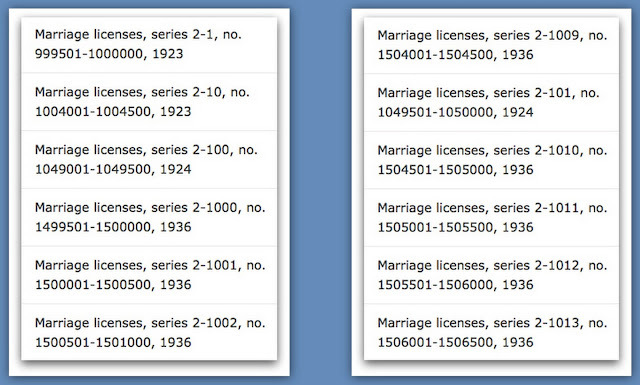 If you have a marriage date, browse to find the licenses issued on that day and then work backwards from there. Generally, couples married the same day or a few days after getting the license. Images, 1920-1941, available online at FamilySearch by visiting at FHC or an affiliate library. Obtain licenses from 1942-1950 from the Cook County Clerk’s Office. One of the things on my to-do list is to wrap my mind around which Chicago and Cook County vital records are available online at FamilySearch and which are only available on film at the Wilmette Family History Center and at the Family History Library in Salt Lake City and which are only available from the Cook County Clerk's Office. So, this morning I took a good look at the catalog entry for Illinois, Cook County, Marriage Records, 1920-1950. Scrolling down quickly, looking for camera icons, it looked like all the licenses from 1920 to 1941 were accessible and that a few after that date had also been put online. But, taking a closer look, I realized that the available "later" records are actually from 1941. It works great for series 1 which covers 1920 to part of 1923. Series 2-1, 2-10, and 2-100 sort before 2-1000 which means they're out of place. Then the order is consistent until it reaches 2-1009 where it jumps to 2-101, putting a 1924 group in the middle of 1936. Then the pattern resumes. Well, actually, it's not a big deal. But, if you're searching for a license and it looks like there's a gap where it should be, it doesn't mean it wasn't digitized. It just means that you need to look for it in another place. One easy way to do that is to use Ctrl-F or Command-F ("F" is for "find") to quickly search for a year. 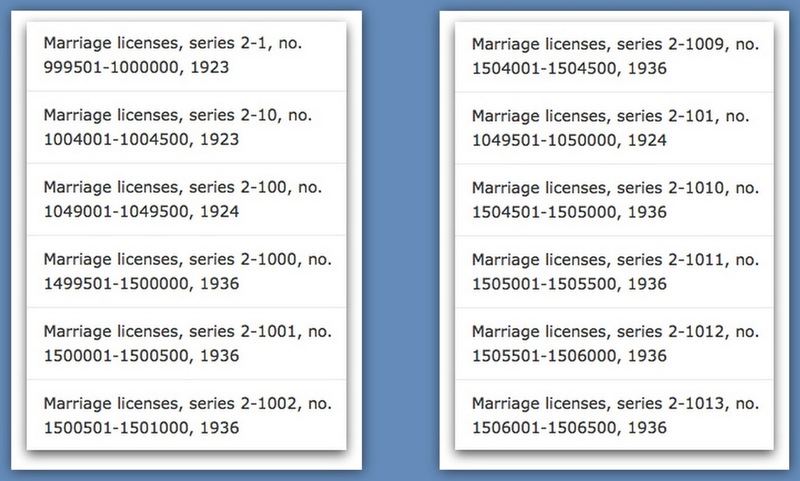 Knowing what's up, I can feel confident in making a mental note that Cook County marriage licenses, 1920-1941, are available on FamilySearch and can be accessed from a Family History Center or an affiliate library.